Plus, the Dalai Lama, U.S.-China CBMs, “discord” in the South China Sea, and Chinese militants in IS. Your China links. The Chinese New Year travel rush has officially begun, China Daily reports. Each year, hundreds of millions of people travel home for the holiday, making this the largest recurring migration in the world. This year, Spring Festival falls on February 19; the travel rush began on February 4 and will last through March 16. During this 40-day period, Chinese travelers are expected 289 million trips by rail – an average of 7 million per day – and another 47 million trips by plane. 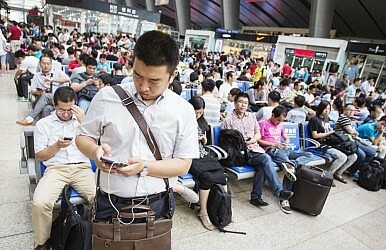 Last year, Chinese holiday travelers made a whopping 3.6 billion total trips during the period. In other news, the National Prayer Breakfast was held in the U.S. on Thursday with both President Barack Obama and the Dalai Lama in attendance. In his remarks, Obama gave “a special welcome” to the Dalai Lama, whom he called a “good friend” and a “powerful example of what it means to practice compassion.” The White House blog has a summary of Obama’s speech at the event. The Dalai Lama was seated at a table with one of Obama’s closest friends and advisors, Valerie Jarrett. However, the White House did not invite the Dalai Lama for an official audience. Speaking of U.S.-China relations: over at AMTI, Rory Medcalf provides an overview of current efforts at confidence building measures between the two militaries. Medcalf examines the sincerity of recent Chinese willingness to create CBMs with the U.S. – specifically, an agreement on “rules of the road” for unplanned aerial encounters. After reports that the U.S. military is holding off on new military exchange programs until China makes good on its promises, “it is time to begin wondering whether the November agreements were more a publicity stunt than a genuine policy departure,” Medcalf writes. First, by expanding the internationalization of the South China Sea, to exert more international pressure on China; second, through a joint show of force by the United States and Japan, to upgrade the deterrent to China; third, sending a signal to the other parties involved that they have no need to rely on diplomatic means to seek mutual benefits; they can depend on the interference of the United States. Even U.S. policymakers will likely agree whole-heartedly with the first two points and only quibble with the phrasing of the third (Washington, of course, prefers to thinks of itself as offering a healthy balance that allows regional states to avoid becoming overly dependent on China). Shen also complains that the U.S. “appears to take the view that neither China nor any of the other countries which are actually located in this region are entitled to develop rules that apply there” – something President Obama more or less stated outright in his State of the Union address. Finally, Global Times [Chinese] reported this week that three Chinese nationals have been executed by Islamic State (IS) after attempting to leave its ranks and return home. The three Chinese are among a group of roughly 100 IS recruits to be executed for trying to escape IS. While analysts often focus on the danger of battle-hardened IS recruits coming back to their countries of origin and wreaking havoc, the Global Times piece provides a counter-argument: that joining IS can be a disillusioning experience for would-be jihadists.